4. I want to use the "A L O T" mod, what should I do? Install Alliance Warpack FIRST and then "A L O T" (FYI: Recommended practice is to install other mods first, and then "A L O T"
5. I can see the new armours on squad-selection, but in-game the squaddies still utilize their original appearance? What gives? This is caused by having an older version of EGM. Upgrade your EGM to V1.085 and above. Update 4: 50 Endorsements! In just two weeks! Holy shisno! Update 3: 20 Endorsements! Very, very nice! Update 2: 11 Endorsements! Thank you all very much! Update 1: 5 Endorsements! Thank you all for the support! I did run into a small problem, which I'm sure is the result of a compatibility issue. When Ashley is wearing the Spectre Armor (Combat bun version), it seems as though the mesh and hair texture aren't quite getting along. The general combat bun shape is present, but has a black line visible along the hairline where her forehead and hair meet. This issue is always present in the squad talent screen. At a distance, I don't notice the issue at all. In some conversations and cut scenes, it seems to work fine as well. In one particular cut scene, there appeared to be a black shape near Ashley's left ear. FYI: I have the Ashley Legacy Project mod and a lot installed among other mods. I do not believe any of my other mods manipulate the same pcc files. First off - apologies for not responding sooner. If I may be so bold - may I get a screenshot of the bug in effect? i suspect I may know what is happening, but I would be grateful for a screenshot to confirm it. I ended up solving the issue by applying the Legacy meshes to the warpack pcc files and subsequently applied the proper textures. I apologize for not updating the post with my solution. Thank you for your response. Hey love the suits btw, but I haven't been able to use them in game. I know it says to generate all TOCs but every time I try to do it, it keeps on failing and giving me this message. System.IO.FileNotFoundException: Could not find file 'D:\Program Files (x86)\Origin Games\Mass Effect 3\BIOGame\DLC\BIOGame\DLC\Alliance Warpack\DLC_MOD_EGM_Alliance\CookedPCConsole\BioH_Ashley_07.pcc'. That is a weird bug. Have you tried downloading a fresh copy of the mod and trying again? For Ash's combatbun, do I install the main file then the optional, or instead of the main? Apologies for the delay - for the combat bun, just install the optional only. Lovely looking gear. Only got a somewhat baffling issue with Ashley, both with this mod and your Warpack-remake of Ashley's vanilla base- and DLC-outfits. The Marksman-fix for whatever reason won't stick and she will just sit behind cover continuously using that skill in a loop more often than not. It's particularly bad in the Armax-arena. None of them contain any changes to that skill, so I really can't figure out the issue short of just not speccing into the skill as usual and/or completely reinstalling the game from scratch. First: I apologize for the late response. 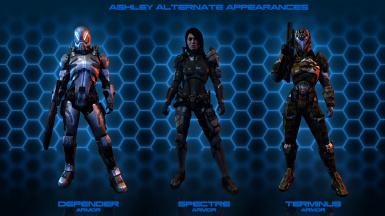 - is Ashley wearing her modded armour (i.e. does get appearance match the screenshots)? - what mods are you using? - any modifications you've made yourself? Appearance changes alright and matches screenshots, it's only Marksman that's a problem. I am listing all of them since only singling out those that 'would make sense' due to their edits - DLC_MOD_ARSENAL_IAmmo, first and foremost - and moving them out didn't yield any result. And, as I mentioned, another oddity is that not even editing the henchmancooldowntime, either in the Coalesced right inside CookedPCConsole nor in the .bin-file within DLC-folders, including DLC_UPD_Patch02, takes hold. I haven't yet checked whether that's the case for other values of the skill. Only other cause for this I could fathom would be some lingering ME3MM-mixin or other. What I have not yet tried is a full reinstall of the game, which I am yet holding off as I wait for the ME3-version of rondeeno's mod-series to be released and wanted to apply a lot-mod after, which as per its description is quite finicky about applying new DLC after it is applied. Thanks for getting back on this! FYI: to give you some context wrt marksman. After patch 1.04, the game 'uses' a new marksman PCC and associated ini file and tells every character to use it. The 'ashley patch' tells Ashley to use the older version of the marksman ability and the associated ini. Try the game with a vanilla ini and let me know how it pans out"
Just loaded a save on Normandy with vanilla Coalesced in place and TOC rebuilt, launched one of the N7-missions. Afraid that didn't do it, with the skill specced Williams just sits behind cover repeatedly using it. This wouldn't be some strange conflict between the couple mod-DLC that edit Coalesced's BIOGame-section in one way or the other, namely DLC_MOD_ARSENAL_IAmmo and the EGM-ones? Even though all other changes do work, including the one player CD-edit done by BW themselves in DLC_UPD_Patch02...leaves reinstalling the game which I am holding off on for now. Hrmmm... This is indeed concerning. I *think* I already tried that to no avail, will give it another go, though. Edit: No, not it either. Before, I did not have unedited Coalesced in place, there's no difference even with that however. Will get back on this once I get around to doing a full re-install of the game. It seems like a clean re-install would be needed. 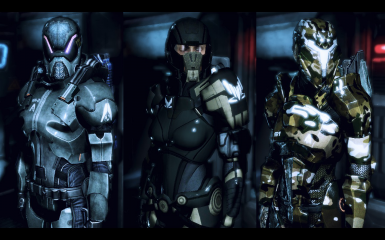 DLC_MOD_ARSENAL_IAmmo -> Infinite Ammo variant of ME3 Weaponry Tweaks: https://www.nexusmods.com/masseffect3/mods/558/? Hope that's detailed enough, although that's some exotic conflict alright, given that none of these touch BioH-files related to Ashley in any way (I also went and deleted CDR's files for Ashley). The only thing I can see causing a conflict, would be the infinite ammo mod, as it causes the character to spin around in confusion (i.e. how can one reload an infinite ammo-clip). OR it could be that the DLC files are using the same mount or tlk priority number. That would be something to consider. Okay, just vanilla-ed ME3 - by way of moving a vanilla-backup in rather than re-downloading everything - and that appears to have done it. Specced into just MM, Williams doesn't do those weird shenanigans anymore with squad power-usage ticked on. I guess the issue may have been that I did power-stat edits such as to "henchmancooldowntime" only in the base-Coalesced.ini within CookedPCConsole, rather than relegate it solely to one DLC, which led to conflicts. For what its worth, am glad to hear that the issue was resolved. WRT power modding: I tend to shy away from making edits to them - too many moving parts to keep track off. Enjoy the mod and good luck with your modding endeavors. I noticed that the readme file recommends installing the mod while Shepard is on the Normandy.Does this also apply to starting a new game? Wow, spectres armors are great! it's posible to make a versión for sheppard? There is? 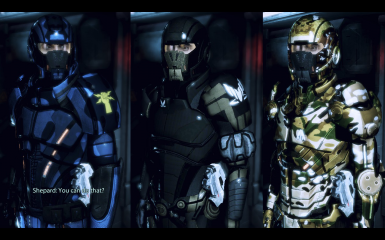 I've been trying to convert these two armors for Shepard but have failed. 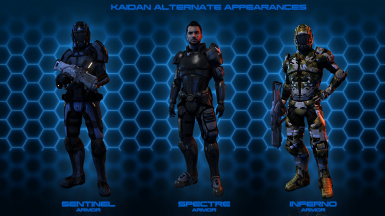 Where is the spectre armor for Shepard? I'm using it along with MEHEM and it's various applications (as well as MOAM) I have.. spectre armor pieces? But they're shiny af and unrealistic. Am I SOL with this? 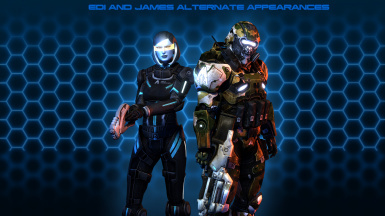 Or is SPectre armor something you have to buy in EGM? The Spectre Armour can be acquired by going to the Spectre Office on the citadel and poking around it. It should be in a series of crates. Hmm.. I'm actually there now, but I can't find any crates. It's the spectre office with the hologram projector, shooting range and .etc right? EDIT: I learned what it was. I'm not far enoguh story wise yet. But thank you for your help, I'm glad you're still around -- and thanks again for these armors. They look amazing! Is it compatible with Ashley Legacy ? Yes, it should not conflict with the Ashley Legacy mod. As to whether I use the same face as the Ashley Legacy mod: Not yet. I do plan to add a version that uses those assets in the New Year. That being said: my other mod, the Ashley Warpack does have a Legacy compliant version. Does it matter in which order i install it and can i use all three Ashley mods together (Alliance Warpack,Ashley Warpack, and Ashley Legacy) ? Yes, you can use all 3 mods together at the same time. They should not clash with each other. I'm having trouble with this mod. It installs fine, I auto-TOC the whole thing, and I do have EGM. 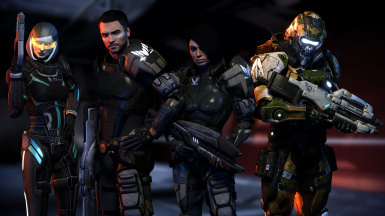 In the squad selection screen, the new armors show up too. However, once selected and I continue to the weapon selection screen and the mission start, the new armors don't show up at all. The squad reverts back to their default look. Have you got the latest version of the EGM? Please ensure that you do. Yea, my mistake. I forgot to update my EGM. Works perfectly now, thanks! Glad to hear that it was resolved. Happy Hunting! Would you be able to put a Mod Manager download up here for this, like Miranda mod has? Or the HR vehicle pack? Unfortunately I don't know how to create Mod-Manager-style downloads. I can try and work on it, but no promises. 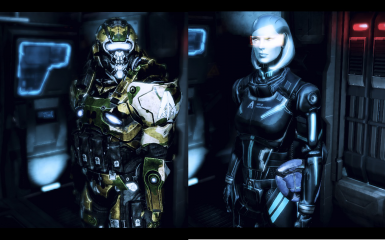 Hi, I like to asked can you make a mod that uses you EDI armor for Femshep?Want to see if you can used EDI head for helmet for Femshep , please let me know? Unfortunately, I cannot promise anything. I'm a bit too busy on the personal and professional front.